Astronomers using the NASA/ESA Hubble Space Telescope have observed a mystery object in the constellation of Böotes. Despite detailed analysis of the light emitted by the object, astronomers are puzzled by the nature of and distance to the object known as SCP 06F6. All we know comes from a series of observations made over the course of a few months. The object was first detected on 21 February 2006 while scientists were using Hubble to survey very distant galaxy clusters for supernovae. The object continued to brighten by a factor of over 100 during the course of the next three months, without exceeding magnitude 21, and then faded away in an identical manner. This in itself is highly unusual – most light curves from transient events are not symmetrical, but have a rapid rise and a slow decay. The second part to this mystery is the spectrum. Follow-up observations with ground based observatories, including the ESO's Very Large Telescope, uncovered features in the object's spectrum. The light in the blue region shows broad line features, while the red region shows continuous emission. Currently there is no other known object to have this kind of spectrum. The final part of the mystery is the object's distance. Efforts to measure the motion of the object on the sky failed. This places the object at least 130 light-years away. 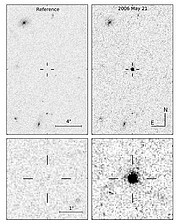 The object, however, could also be extragalactic given its proximity on the sky to the centre of a known cluster of galaxies (CL 1432.5+3332.8) at a distance of 8.2 billion light-years. 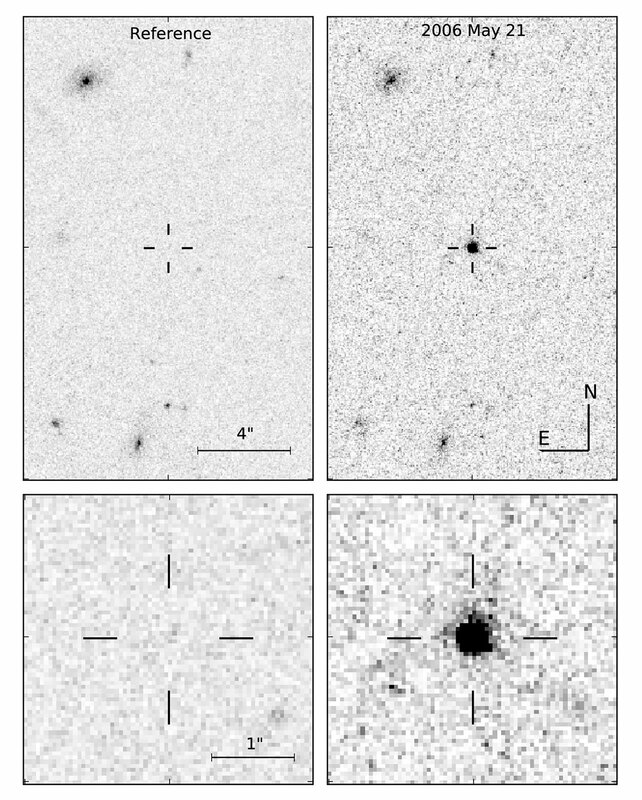 It is likely, therefore, that these observations represent the discovery of a potentially new class of transient object since there is no known comparison for either the light curve, or the spectrum. Objects of this unknown class could potentially be of great interest for future sky survey programmes. Image caption: The sudden appearance of the transient "mystery object" SCP 06F6 in Hubble field of view. The lower image represents a zoomed in view.